I can't tell you how surreal it felt, sitting all wrapped up in a snowboarding outfit in the heat of the Middle East... But that's Dubai for you. Always looking to make the impossible possible! Ski Dubai is the first indoor ski resort in the Middle East. It's a huge snow facility that provides slopes for skiers and snowboarders, a huge snow park for tobogganing and family fun, plus an extra special Penguin Encounter attraction where one could actually hug and kiss a real live penguin! Some of you might already know that I am an avid snowboarder myself, so when my friend Cristina the Desert Fox and I visited, I got suited up straightaway for the snowboarding gear. Cristina is a beginner. 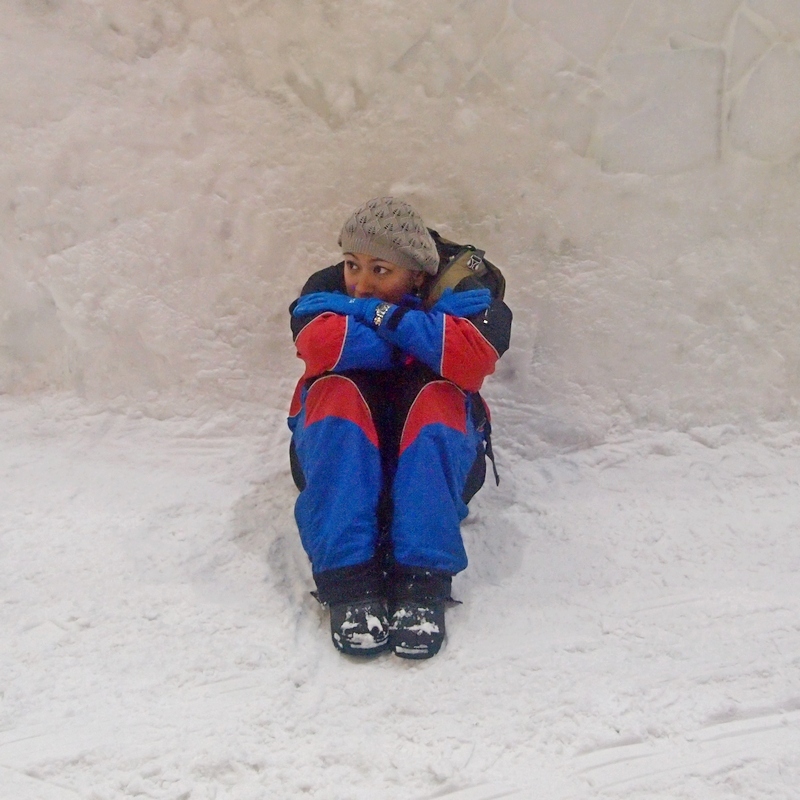 Luckily, Ski Dubai offers introductory lessons for new learners like her! I watched her for a little bit before heading out to the lifts. The instructors were really good, and I could tell they enjoyed their jobs teaching both kids and adults how to ride. I actually picked up a few tips from them myself! After a few minutes of cheering Cristina on, off to the lifts I went. Honestly, since all the snow in there was fake, I had minimal expectations... Which is why I was pleasantly surprised to find the snow really nice and soft! It felt like I was back snowboarding in the mountains of California! The powder was fresh, not gooey or wet, and I snowboarded smoothly across the slopes! Another thing I enjoyed about it was that right after my runs, I could easily go back into the lifts without having to worry about any queue's... Unlike snowboarding in peak season in a real ski resort where it takes you at least 15 minutes before you could get a lift... at Ski Dubai, everything was quick and efficient! At one point during one of my runs, they dimmed the lights of the resort and started an amazing light show! All of a sudden, loud, soundtrack-like music blared from the speakers, and colorful lights started flashing to the beat of the song! Since this was all happening while I was boarding, I felt like a rock star! It was fascinating! After spending a couple hours or so in the snowboarding area, Cristina and I took a quick lunch break before heading off to the Penguin Encounter. It was probably one of the cutest things we have ever experienced! 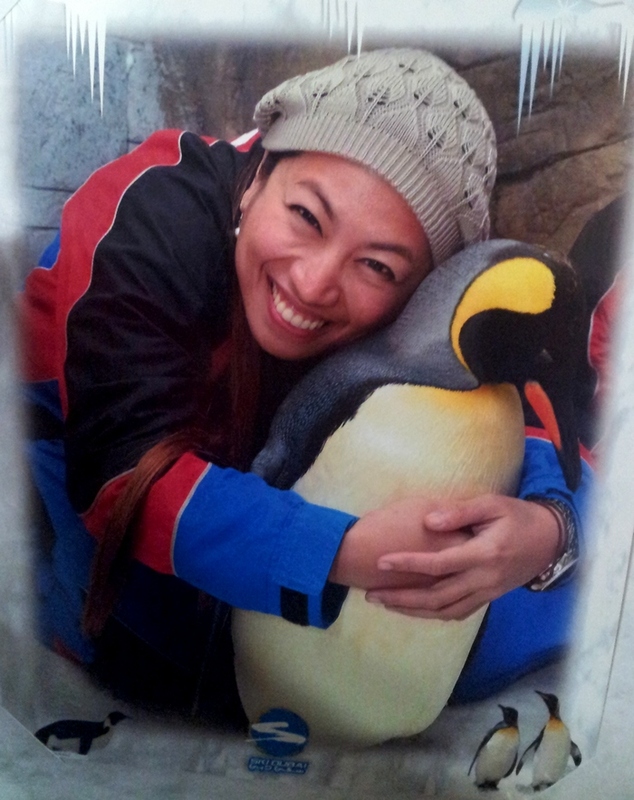 We met over a dozen penguins, learned about them from the trainers, and actually got to hug and kiss one of them! Ski Dubai is the only facility in the world that would ever let you do that, so I consider myself very lucky to have been able to lock lips with a happy feet! 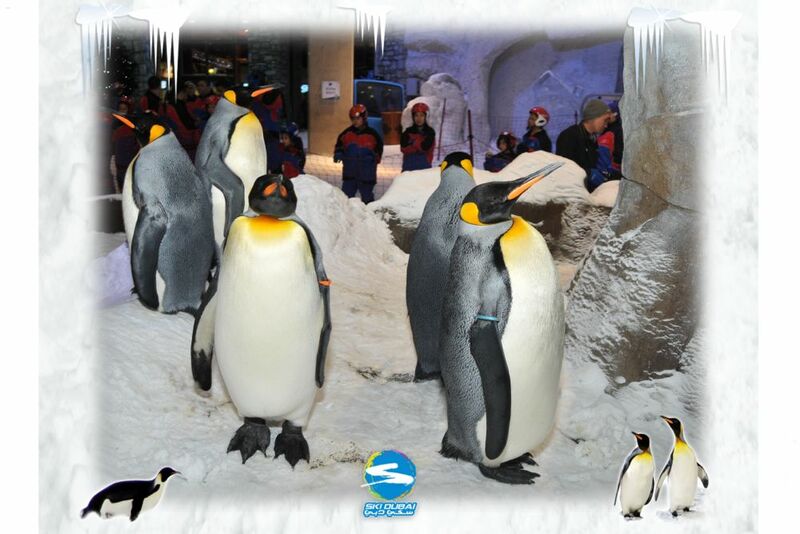 Unfortunately, you are not allowed cameras inside the Penguin Encounter as they have photographers of their own. I could only afford to buy one of the photos they took of me... and here is a snapshot of me and my new friend, Mumble (that's not really his name, I think it was Squeaky actually). It really was a treat experiencing a fun snow day in the middle of the desert. I could only imagine how fun this must be for the families in Dubai who haven't had the chance to experience snow yet! Or how exciting this must be for the locals who would love to try snow sports like skiing or snowboarding, but never had the opportunity because of their location! Ski Dubai is a genius attraction and I had an AMAZING time! **For more information on what Ski Dubai offers, visit their website here.